Having owned two fifth wheels, we’ve taken pimping our home on wheels to new levels; adding lots of bright color and individual personality. We’ve theme-decorated which made it even more fun to plan, collect and decorate with our new accessories. 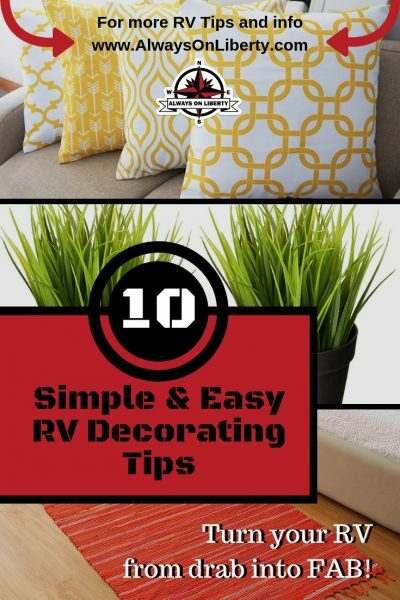 Whether you buy your RV to live in full-time or use as a seasonal camper, there is such a plethora of cool ideas to put color and style that will make it your own. 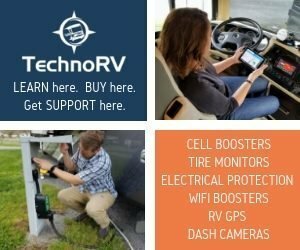 But don’t think you have to rush out and buy a whole bunch of paint and wallpaper to improve your RV. You can simply personalize and brighten it with decorative wall art, accessories, textiles and kitchen counter gadgets. But sometimes, you just don’t have the creativity or forethought to make it all come together. So I’ve come to help with that in this blog. Girls love them, guys hate them but oh well, girls win! Either way, pillows are a quick and easy way to put pops of color in your coach at the same time, adding function. Though I love pillows with pompoms, fringe and cool trims, they won’t last long because we have two curious cats. I like to change my pillows often so I don’t spend a ton on them. But I went one step better of not having to buy bulky pillows each time I wanted to change them out. So instead, I would buy pillow covers. Being throw pillows are standard sizes, they’re easy to replace for far less than buying the pillows themselves. Oh, and also, you can store them in your cabinet for less space than four thin dishtowels. 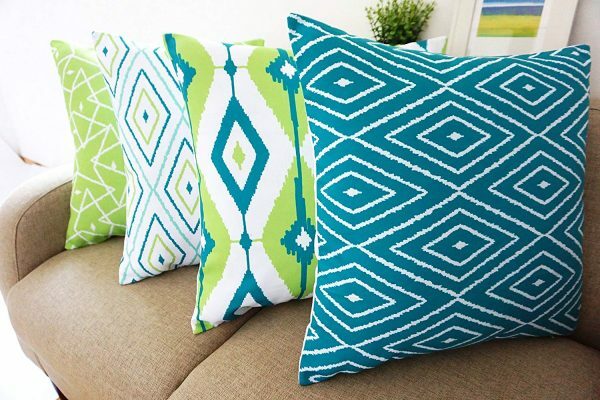 Look at this adorable set of four lime green and marina blue pillow covers that you can get for the price of one pillow you’d find in a brick and mortar store. Check out those colors!! Or, if you own a boat (because we do have boat and yacht owners who read our blog too! 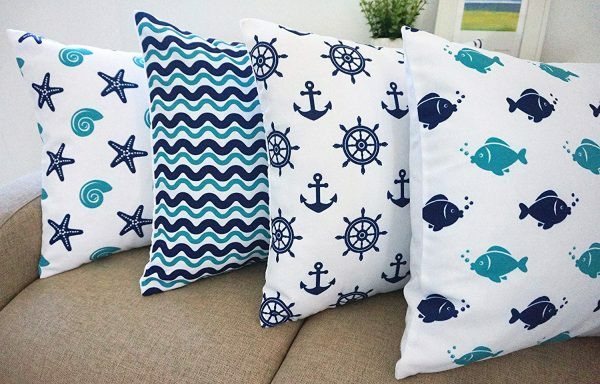 ), check out these cool set of four nautical pillow covers for your throw pillows! And who says you can’t decorate your RV in a nautical them anyway? 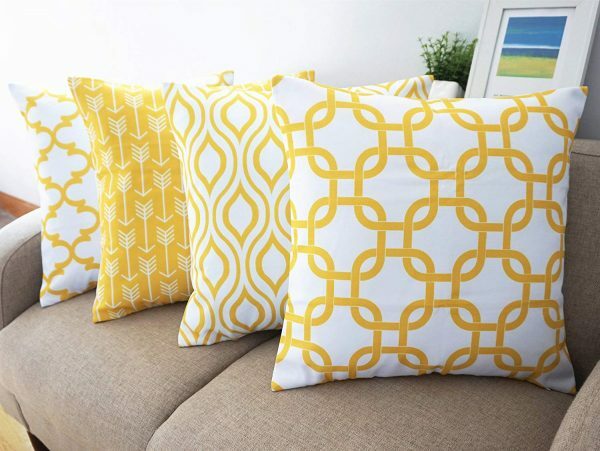 And, if you love cool patterns but wish to keep just one color, this set of four sunshine yellow and white pillow covers will make your dinette, Murphy bed and sofa pop with sunshine and smiles! If you don’t like any of those colors, just click on any of the images above and see what else they have that may fit your decor or taste. Some of them have different color and pattern options. 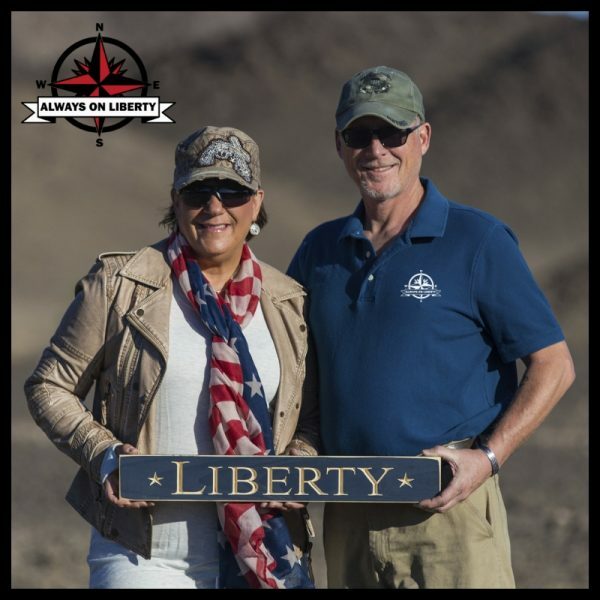 We don’t have these in our RV however, we’ve seen several who have put them on the walls of their travel trailers and fifth wheels. 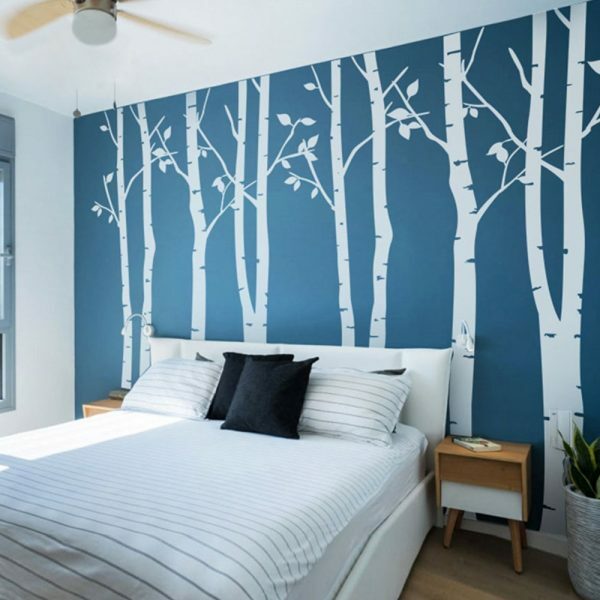 Check out this amazing bright wall mural vinyl decal that you can install as your bedroom headboard. 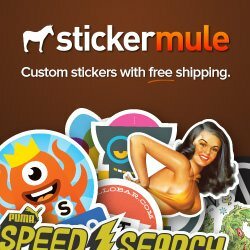 Most of the decals are repositional and not permanent so if you decide after a year you don’t want them, simply remove them. Make certain if you buy them, you follow the manufacturers’ installation instructions. 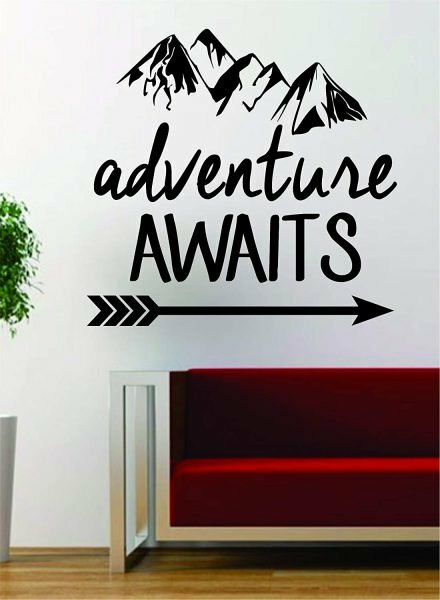 Here’s a great vinyl nomadic Adventure Awaits decal that would be perfect for a small wall in your RV or camper! This one costs less than two Starbucks lattes! 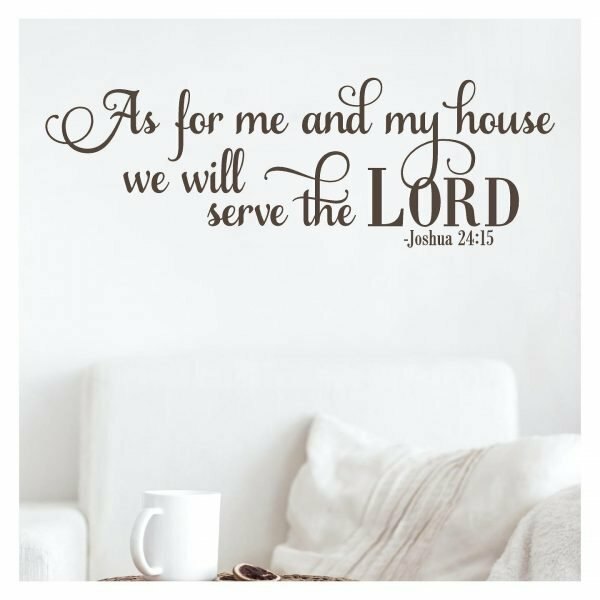 And, if you’re into spiritual phrases, this beautiful Christian biblical verse vinyl decal may be perfect for your family! We have quite a few frames peppered throughout our Landmark. We have some with family photos and others with small pieces of artwork. If you’re looking for a more uniform or simple look, you can pick up inexpensive lightweight plastic frames that can be secured to the wall with Command Strip Velcro or already have easels for table or countertop display. You’ll want to buy frames where you can pick exactly what color and size you want so you can make your own arrangements. Or, if you want to print photos of yourselves and give them as gifts, these are perfect as give-aways! If you have a refrigerator that magnets will stick, why not do what we do? 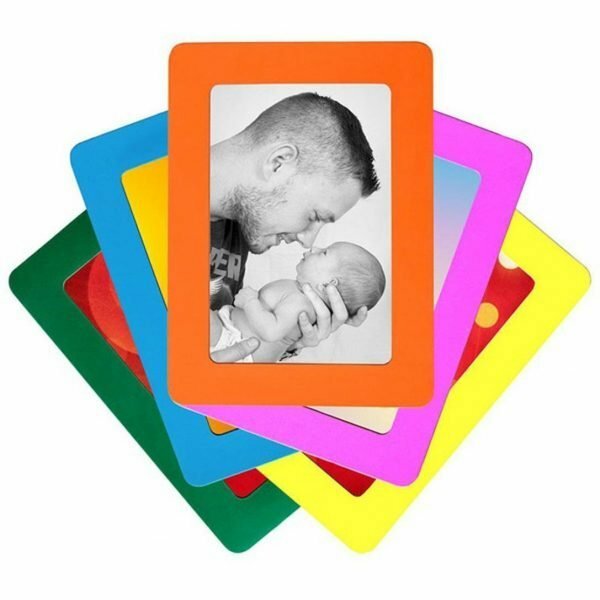 I have a dozen magnetic 4″x6″ photo frames like these below of our Grandson plastered all over our reefer! I don’t have to wrap or pack these for moving day. They just stay put! OH! And if you don’t like the colors? That’s what paint is for! A simple can of spray paint or acrylics can coordinate your frames to your decor. if you have cats, you know owning houseplants is a no-no. They may be toxic or Fluffy just looks at it as a way to piss you off by knocking it over. And really, who has time to take care of plants anyway? Instead, create your own arrangement or you can buy them already to be displayed on a table or counter. 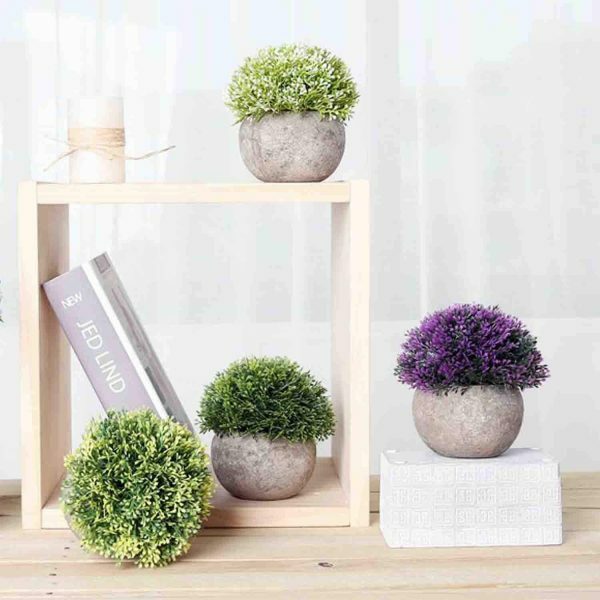 Check out this stylish four pack artificial mini topiary shrubs! 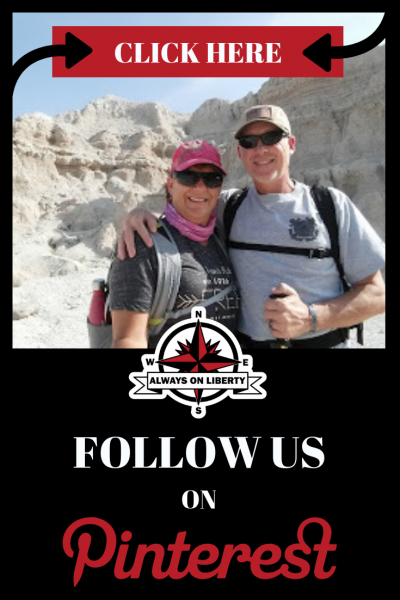 Do what we did! 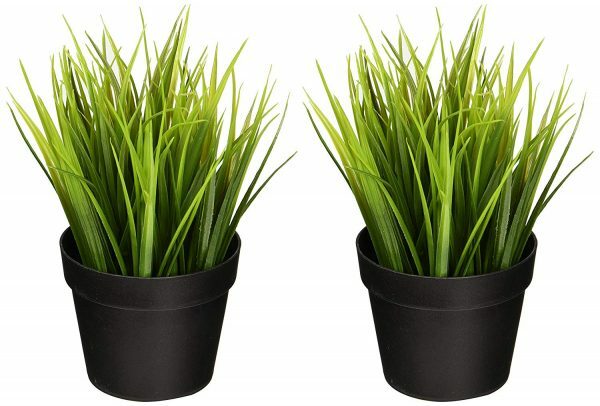 We bought these two plastic grasses at IKEA for dirt cheap! We also bought little galvanized aluminum bucket planters for them to sit in to give the look of clamming buckets you see on the beach. Also, don’t see the color of pot you want, then personalize it with paint! 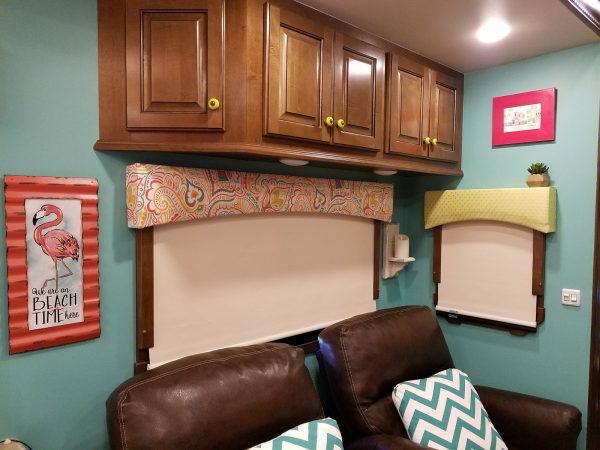 This is another way of bringing in pops of color into your motorhome or towable RV. Just like the pillow covers above, these can be purchased pretty inexpensively. 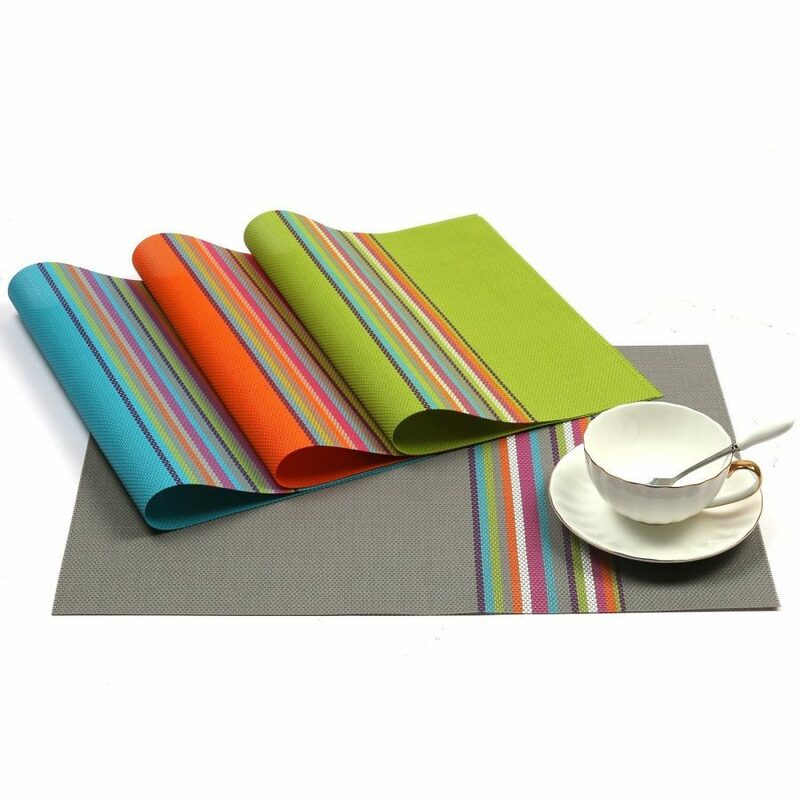 We found this set of four PVC woven vinyl placemats in an array of bright colors. If you click on the link, they do have other colors (some are also muted or natural colors) and style of placemats that may be more suited for your decor. Now, word to the wise, they say heat-resistant however, I wouldn’t trust to place hot-from-the-oven or hot microwave dishes on them thinking these will prevent table surface damage. I always recommend using trivets or pot holders underneath them. And if you’re really looking for something really unique, you can find them at craft fairs and specialty shops. In a recent remodeling project in our Landmark, we removed all of the carpet and replaced it with versatile vinyl plank flooring. While we totally love it, we felt it still needed a little warmth for our kitties to lay and add color to balance our other decor features. So, I bought a few colorful rag rugs in various colors since our RV is decorated in bright beach theme. By the way, if you click on that link, you’ll notice they also offer different sizes and colors. You can mix and match them without spending a fortune. 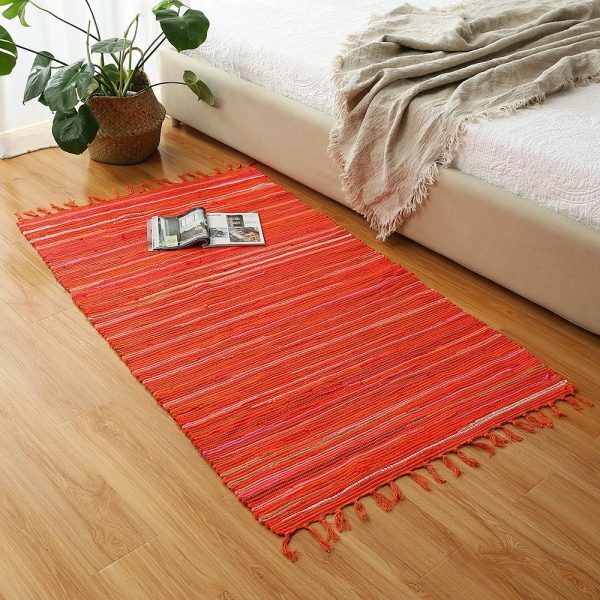 We simply measured the area and bought from Amazon since we don’t want to be trapping all over town looking for the perfect rug. I also took into account that cats tend to make a bee-line to carpet or rugs when they hurl up a hairball so they needed to be machine washable. 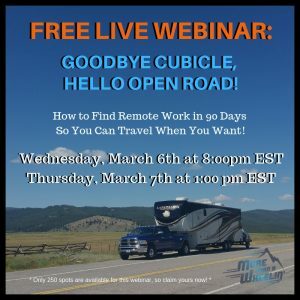 They also are easy to fold up on moving days and quick to shake out the cat hair or fuzzies that seem to find their way in our fifth wheel coach. 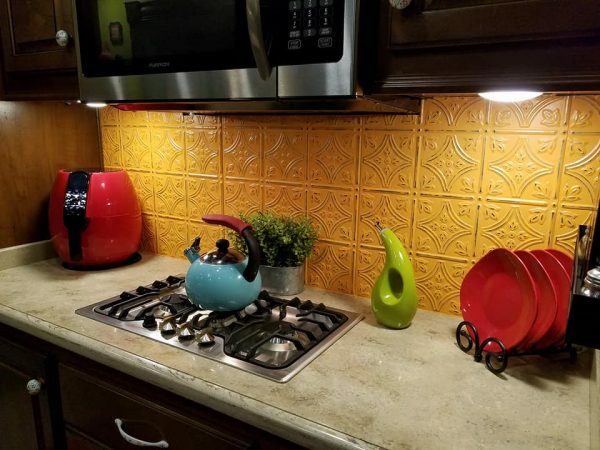 Kitchen wares can also compliment your colors and theme. 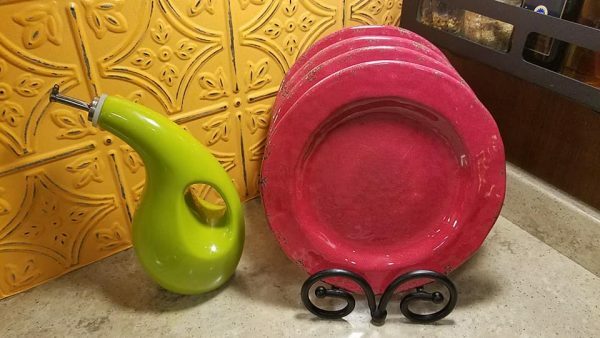 My red melamine plates stacked vertically in a black metal decorative plate rack can double as decor and easy-grab accessories. 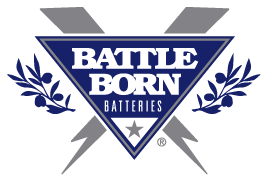 The plates are lightweight and unbreakable making them easy and carefree to store on travel days. And check out that cool limey green olive oil bottle which gives the other colors a pretty pop. You can see how it gives a splash of color in the corner. I know! I know! 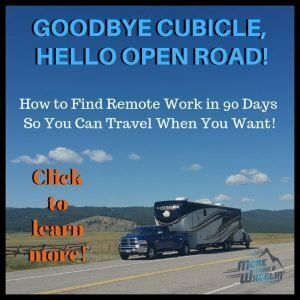 The point of RVing is to eliminate unnecessary clutter. However, not everything that ‘sits out’ is just fluff. Personally, because our RV is our home, I’d rather not have just a bunch of plastic this and plastic that sitting out. 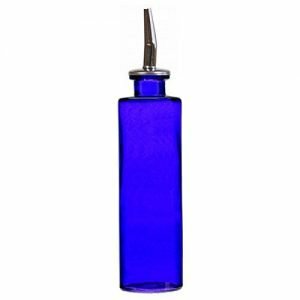 We have our dish soap in a cool glass blue bottle with a pour spout. 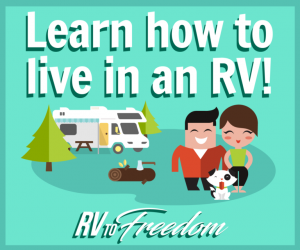 In an RV, because you don’t have much cabinet storage, you may have to leave your coffee maker, air fryer or other small appliances out on the counter. So, that presents a perfect opportunity to pick a cool color to accentuate the rest of your decor and theme. As you can see, I’ve chosen my red GoWise Air Fryer to sit opposite of my red sandwich plates on either side of our cooktop to create symmetry. Lighting isn’t just for seeing in the dark. And, it doesn’t need to be boring. Lamp shades and globes can present a cool decor feature that offers ambiance. But you can also change out some of the glass shades on your sconce lights and pendant lights like we did! Look at that pop of color! 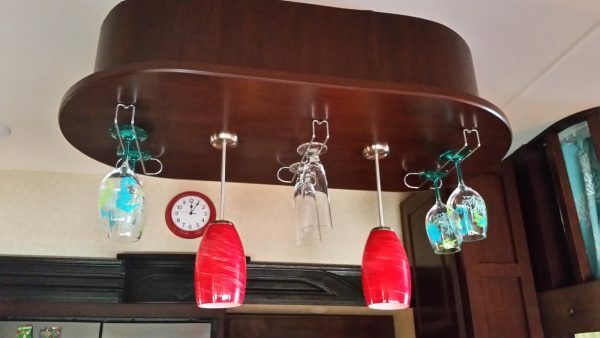 In the rear of our fifth wheel, we strung up colorful patio lights on the back window for some party-fun. You can find your own lights in different colors, themes, and sizes. 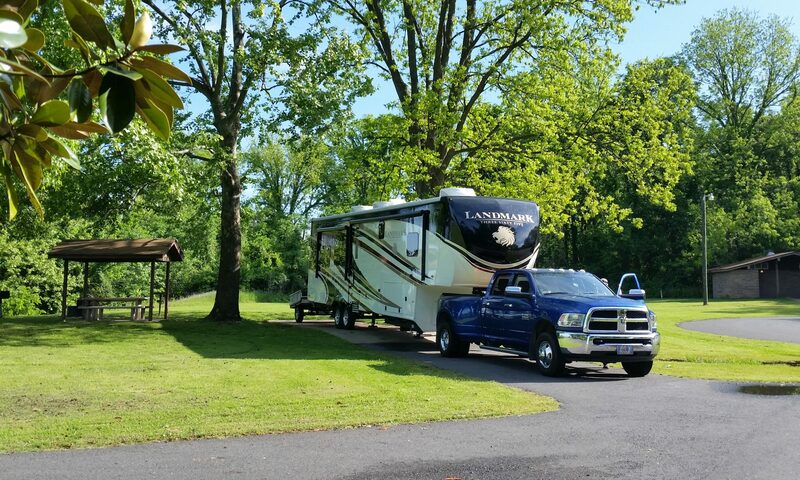 So, as you see, it doesn’t have to take a whole lot of green to personalize your RV or camper. And remember, you don’t have to change it all at one time. When you’re living in such a small space, less is more. Even the smallest pops of color will liven up the wood and fabric features already installed in your coach. 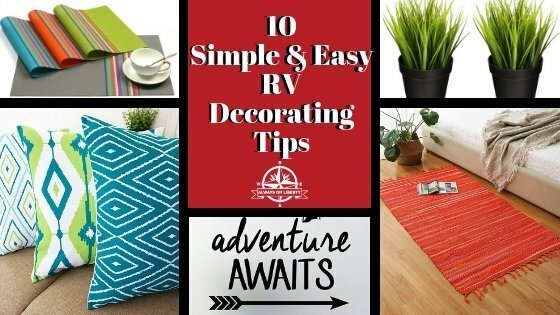 You’ll not want to miss reading more RV interior ideas…. Love these ideas, especially the wine glasses hung from the kitchen light fixture!